To discover more about dyscalculia, click here to read ‘Dyscalculia: Lifting the Lid’. Some picture-thinkers may have difficulty with abstractness of maths. It is often problematic for them to understand the meaning of concepts such as the times tables and therefore they find it extremely difficult to memorise them. In order to calculate the right answers in maths, it is necessary to be able to think sequentially. This is often problematic for imaginative or explorative thinkers. Frequently, difficulty with maths (dyscalculia) is accompanied by issues with telling the time, managing time, and/or personal organisation. Davis Maths Mastery is a programme that enables creative thinkers to utilise their imaginative strengths to master maths. 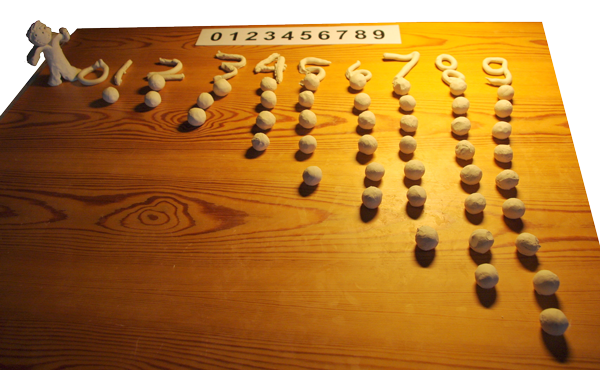 After initial Orientation Counselling, the key concepts that underlie mathematical understanding are created in plasticine, providing a sound foundation for building mathematical skills. Subsequently, a series of hands-on exercises lead rapidly to understanding, competence and certainty in the basic arithmetical functions of addition, subtraction, multiplication and division. Other areas of maths can be addressed according to individual client needs. To discover more about dyscalculia click here to read ‘Dyscalculia: Lifting the Lid’.